Aloha! Have you ever been to a place called...Hawaii? ...and it was amazing! I can go on and on about it, but I'm going to save that for a later post after I have a chance to really savor all the special moments of my vacation. 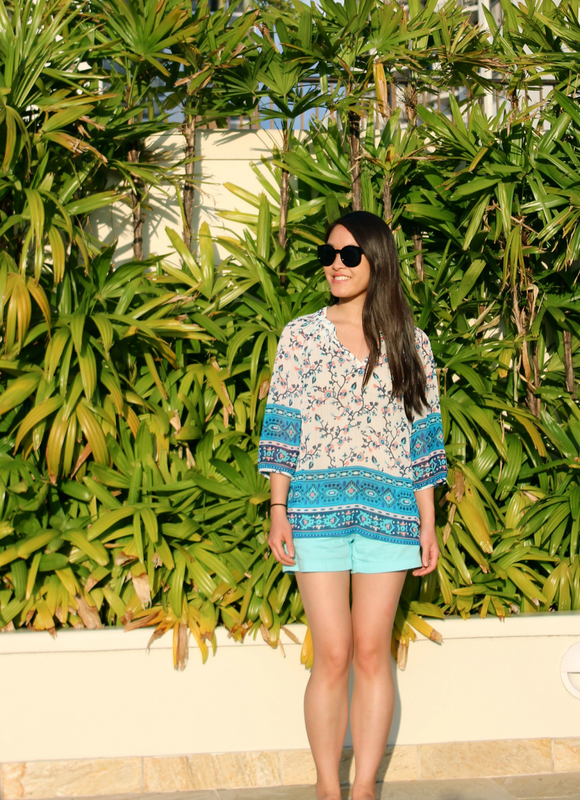 I've missed you and wanted to drop by and share one of my vacation looks with a vacation packing tip. When planning outfits for vacations, I always pack some blue pieces. It's a color that easily pairs with every other color which is ideal for when you are trying to fit everything in one luggage with extra room to do some shopping! 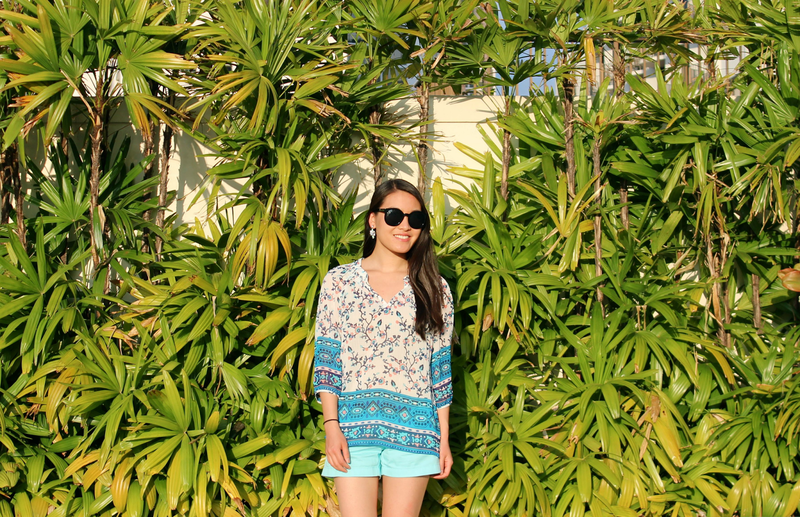 And since I wanted a summery look, I chose light blue shorts to pair with a few tops. 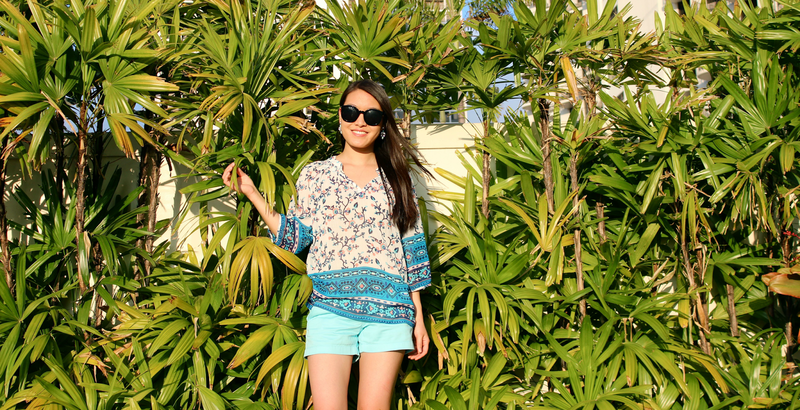 For this outfit, I chose to place an emphasis on the blues, and chose a mixed-patterned flowy top to go with the shorts. How awesome to be in Hawaii! I'd love to visit one day. I hope you get the chance to visit too!! ugh that weather is making me SO jealous! Aww wish I could send it over to you!! I grew up in Hawaii and go home at least once a year. I am amazed at the gorgeous views when I am landing. Hope you are having a wonderful trip and let me know if you need some food recommendations. It's all about eating in Hawaii. Thank you for joining TBT Fashion link up. I wish I knew! I could've asked you for tips! :) But yes, Hawaii is breathtaking and don't worry, I ate a lot!! I can't wait to go back. You are so lucky to have grown up in such a beautiful environment! I can't count the number of times that my mom has been to hawaii but I have never been :( I really, really want to go (except for the 6 hour+ flight from Massachusetts!) . my spring and summer wardrobe is filled, I mean FILLED, with these types of blues, turquoises, etc. I'm blonde and fair skinned so I love how they look on me. I was also taught a little trick that this color will bring out the tan color of anyone's skin better than any other color! But it is my fave color also. I was in the same boat! My parents have been multiple times before they finally decided to take us ;-) The flight isn't bad. I think the excitement of going to Hawaii makes up for it! Looks like you're having a BLAST in HAWAII!! Can't wait to see more of your pics! Hawaii has always been somewhere that I would love to see! All the pictures I've ever seen have been so beautiful. 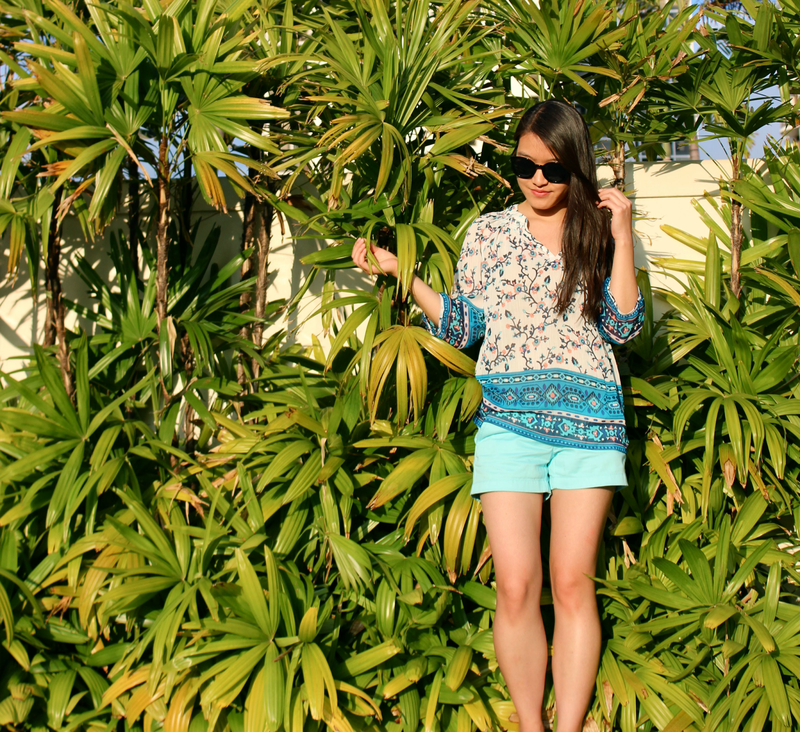 Luv this outfit ...the color is so cool and fresh like a great summer color. Lucky you I see it's sunny and warm where you are. LOL there's snow on the ground here, I am so jealous!! Everything about these pictures screams spring/summer(which happens to be my fave season) - sunny, bright, cheerful- just plain lovely! Love the top - really cute! Don't you just love Hawaii? I am extremely lucky that my Dad has a vacay condo just north of Kona....worth the 12 hours of flying to get there! Lovely top! And i love, LOVE Hawaii!! Always wanted to go to Hawaii but not made it. Love these outfits, so colorful and who doesn't love color year around no matter where you are. the sun looks amazing there!! and so do u! :) so sophisticated yet beautiful at the same time!! Watery blues just scream vacation. I love this look! Love that printed top! So summery, I can't wait for warm weather! Your blouse is lovely, I love the blue and the pattern. It goes well with your shorts. The photos are stunning!